Why are grants so important? Hi Friends – All around the world there are big issues that people face and governments/NGOs trying to solve these problems, and it can seem overwhelming. Starting in 2019, I have decided to publish a recurring blog to explore some of these big issues and how they impact our corner of the nonprofit and public sector space through grants. I’ll be drawing these posts from case studies, research and actual clients to talk about these big topics. Join me as we take a deeper dive! Over the past few years there have been more conversations about racial/ethnic inequities in all sectors, particularly employment, housing, criminal justice system and education. 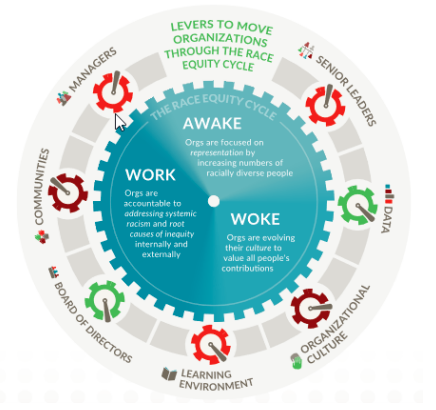 These conversations are not happening in silos anymore as the philanthropic sector is requesting (and sometimes requiring) that organizations address racial/ethnic inequities in not only service delivery, but in the organizational structure itself. This is happening through formal policies, official statements, strategic plans and Board/staff recruitment goals. How are the philanthropic and nonprofit sectors responding to issues about racial inequity and what do you need to know? When I read the 2018 Nonprofit Agenda published by The Center for Nonprofit Advancement, the figure below jumped out at me as there are multiple ways that organizations can think about these inequities. This is not a small topic and it requires shifting an organizational mindset (and potentially some key priorities) to move the needle. Also, I have seen numerous foundations ask point blank in applications about the racial/ethnic breakdown of staff/board members and how this is reflective of the people you serve through the work itself. Some of my clients are addressing these challenges by establishing a core values statement, incorporating the expansion of racial and ethnic diversity of board and staff into strategic plans (even with specific targets to measure progress towards those goals) and opening up dialogues to discuss these sensitive topics further through open forums. Establish some goals with your organization to enhance your diversity. What will you do this year to tackle this issue and what outputs will you have to show for your efforts? Discuss these issues with staff members within your organization to determine the gaps and highlight areas of strength and improvement. Start small and build up your organizational solutions each year. Rachel Werner, MPA, GPC, PMP is the CEO and Owner of RBW Strategy, a grants consulting firm located in the Greater Washington DC area. She likes to think about what’s happening n the world and how this funnels down into our corner of the universe.